Oct 11 is (was) National Farmers Day. I don’t know about you, but my social media was full of “If you ate today. Thank a farmer (rancher)” or something like that. I think that is great. Thanks farmers. Thanks ranchers. Thanks for all the hard work you do. Thanks for all the long hours. Thanks for high risks. Thanks for making sure we have enough to eat. Thanks for driving the economy of rural America. Thanks for allowing the other 98% of us to go work on whatever we happen to work on without worrying about where we will find our next meal. It is a hard job, and we appreciate it. But…please. Don’t thank me. Instead just pay me a living wage for my products. Products that unlike what people spend most of their money on are vitally important to our survival. In the past 50 years Americans have enjoyed cheaper and cheaper food (as a percentage of their overall income). 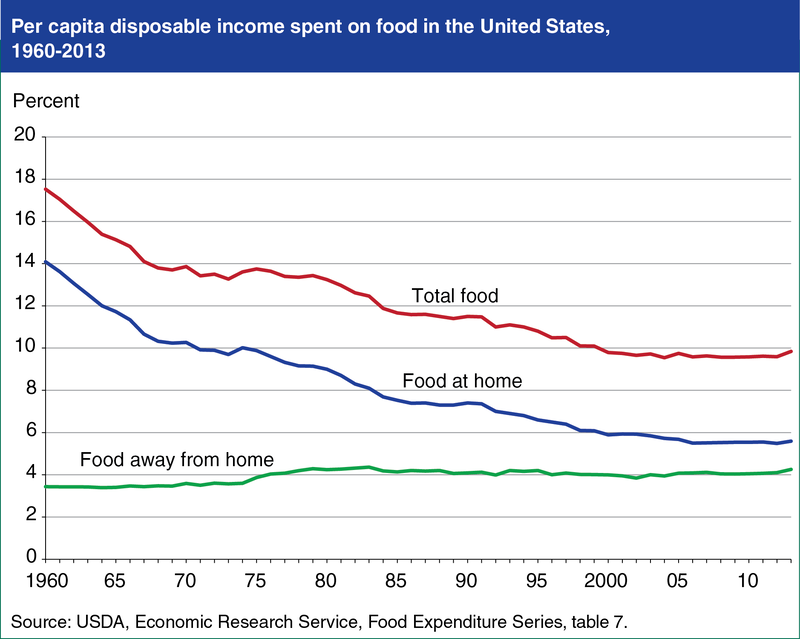 In 1960 we (Americans) spent 17.5% of their income on food. Today that number looks a little more like 9.5%. What else (that is important to survival) is that true for? Not housing. Not energy. Not health care. Not anything. And some more indicators: Wheat is currently (Oct 2018) as much per bushel as it was in 1996. Corn also approximately the same as 1996. Coffee is $1.22 per pound; which is less than it cost in 1977 – Yet a café Americano still costs $4.89. I have been told more than once “Show me your check book, and I will show you what you value.” I think that is very true. So, for “National Farmers Day” don’t thank me. Just value our work and our product enough that we can make a living providing it. Thank you for your regular newsletters and for this blog post. I am not a farmer but I could not imagine what I would feel like if I didn’t make food my number one priority. It’s important to me how the food is raised (ethical, even loving attention paid to all animals and plants), where it comes from, who cultivates and harvests it, and how it’s treated or processed before it gets to me. I spend 80% of my income on a combination of local, organic, and sustainably-raised foods. I’m not wealthy but I am fortunate to be in a situation that allows me to feed my family the way that I do. We need a massive reprogramming in our country to teach people that you get what you pay for. If it comes at a super discount, chances your food is not what it seems. We need legislators to step up and reverse the damage that was done to farmers decades ago, ergo the damage that has been done to public health. I’m grateful that more schools are incorporating gardening and eco classes in their curriculums. Thank you for the work you do!